I finally saw "Memoirs of a Geisha" last night. I've been waiting to see this since I first heard the movie was being made because I read the book about 4 years ago and I could not put it down. It is one of the most fascinating books I've ever read, and I loved learning about the Geisha world. In choosing books to read, I usually look for settings in worlds I know nothing about, cultures that I can learn from. I love learning about Asian culture, the slavery era in America, Native Americans, and even the South. These are all worlds that are foreign to me and that fascinate me every time I enter one. I decided to reread the book before I saw the movie and I got through it pretty fast since we had our 12 hour trip to and from Ohio a few weeks ago. So I went into the movie with a knowledgeable perspective. I don't know why I put myself through the torture. The movie is NEVER worth seeing after reading the story first. I'd say the best book-to-movie transition I've experienced is Gone With the Wind. But you also have to take into consideration that Gone With the Wind is a long movie, so they were able to stick to the story with some continuity. Memoirs of a Geisha is gorgeous, I'll give you that. The settings and wardrobes were breathtaking, especially those set in Japenese gardens. But there was so much missing from the story. I was constantly thinking to myself, how will anyone who has not read the novel know what is going on? It was patchy and confusing. Bottom line and personal opinion of Tara Chapman: More disapointing than most movies based on popular books. There are thousands of movies out there--don't pick this one next time you're at Blockbuster or logging onto Netflix! I have an addiction to recipes. I just love them--I love reading them, I love watching people cook, I love trying them out myself. I have a rediculous amount of cookbooks and I read them and re-read them all the time. Not only that, but they are marked up with little post-its and then cross-referenced into dish type categories in Word on my computer. That way, when I'm looking for something specific to make, I can look under "Soups" or "Main Dishes-Pork" and find something pretty quick. (I know at this point some of you must think I'm crazy.) But wait, there's more. Before we got rid of DirecTV, I constantly watched the Food Network--it was by far my favorite channel. Now that I don't have it anymore, once in a while I'll pop in a Food Network DVD because, yes, I bought a few of those collections at Target. So once in a while I can get a food fix from a favorite chef or two. To me, food is the prettiest thing to look at on TV--it's so vibrant and colorful. And then there's the internet. When I'm bored, I'll settle onto the couch with Mark's laptop and start browsing recipes on allrecipes.com or foodnetwork.com or epicurious.com. As if I don't have access to enough recipe ideas, I constantly work on building up my online recipe boxes. Okay, I'm hearing through the grapevine that a few people are thinking I'm in the depths of despair or something because of my last entry. I swear to you all that I'm absolutely fine--I'm not freaking out, I'm not depressed, I'm not looking for security (I KNOW where my security lies!). I was merely pondering some things that have drastically changed for me. Just thinking out loud. As my friend Abby says, her blog is about death and darkness, while mine is about coffee and donuts. =) So I guess I can see where the concern comes from. Thank you to those who care. I had an epiphany today: there is nothing familiar going on for me right now. I don’t know my family, I don't know my new friends well, I don’t know my old friends the way I used to, I don’t know my church, I don’t know my town. I don’t know anything anymore except for my husband and my kids. Praise God for my own little family. There are things about God I don’t know anymore either—things I thought I knew in the past and now I question. It’s not the most important things about God—I know He loves me, I know He’s faithful, I know He’s my Father. Things are just different than the things I always learned, and it confuses me. What a weird place in life to be. I crave familiarity. I know there are a lot of people who don't understand the obsession and who think it's trivial compared to Starbucks, etc. I do like Starbucks coffee. But as a true Bostonian, my heart will always love Dunkin Donuts more than anything else. Quick anecdote: anyone watching the Red Sox in the playoffs a couple of years ago could not have helped but notice Ben Affleck and Jennifer Garner at a few games--they flashed enough pictures of them. You may also have noticed that Jennifer always had a Starbucks cup, while Ben always had a DD cup. Ben grew up in Boston. Silly story, but just wanted to share since I know a ton of people who also noticed--and these are people who aren't from Boston, they just know me! 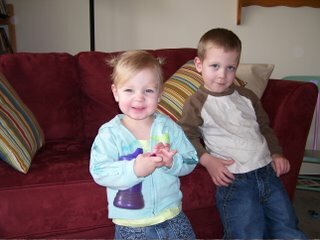 Here's Jake and my little surfer girl, Rory--just hangin out around the house today. This may be the first winter of my life that I'm dying for it to end! I am a fall/winter person by nature. I love everything that comes with cold weather--the leaves changing, pumpkins, snow, holiday season, sweaters... But I think that may change a little now that I have kids. They are so sick of being pent up inside and we're all going crazy. It also may be because of where we lived this year--on the second floor of an apartment complex. To get the kids anywhere to do anything, inluding to play in the snow, is a major production. It will be interesting to see if next winter is different, being in our own place again. I wonder if it will be easier on the kids, having more space to play inside, being able to play in their own backyard anytime they want. We'll see. Anyway, the windows have been open, the kids are wearing sneakers instead of boots when we go out, the grass is getting greener, we're wearing lighter coats...we're almost there! Best of all, Cadbury Eggs are in the stores (and my cabinet!) which is always the first sign of spring. I'm about to go hard-boil a dozen eggs to decorate! Who ARE you, Boston Belle? "Tara, I can't believe how interesting you still are...maybe I thought part of our identity got washed away with motherhood and family life...but you have shown that we can remain the same pensive souls we always were. I say amen to all your thoughts on "B&N" because, for some strange reason (seriously unbeknownst to me), it has remained my favorite place in all the world for almost ten years now. I'm there ALL the time!" I can't figure out who you are--my guess is Amy S, but I want to know for sure. So whoever you are, Boston Belle, post again and tell me your identity...Thanks! It's been 8 months since the last time I packed up our existence. Only 8 months! How can I possibly be starting this again? And we have STUFF, man--a lot of stuff. We really down-sized with our last move, so this time may be a litte easier, not to mention there are bins and boxes that never got unpacked here because there just wasn't space. But still, here we go again. Mark was in a frenzy over the weekend. That's what he does--during the week he has stuff on his mind so he keeps to his weekly routine, but once the bug hits on a weekend, there's no stopping him. He goes and goes and goes and asks questions about my stuff and some of his stuff and about half filled storage bins and if we can chuck this or that...it never ends until Monday, and then I can pack peacefully. =) I just sit and play on the computer or watch a movie and go about my routine with Jake and Rory during the frenzy. It's easier that way. We both know what works for us so we stick to it. I hit the Mall of America today. I only go once in a while and it's always to visit my friend Abby, who works at Starbucks there. It always brightens her day to see my kids waiting in her line. I went today because my mom's birthday is next month, along with Mother's Day so I had some browsing to do. There are lots of specialty shops there so I thought I'd check some out since my mom likes specialty stuff. I never SHOP at the Mall because it's more of a place for us to go just to get the kids out of the house. The Mall is a world of wonder for my kids--Lego Land, drinks of water from Abby in special Starbucks cups with GREEN straws. All this to say, I got a green tea latte today (thanks, Abs!!). I wasn't sure how it would go over because I'm a no-tea/all-coffee kind of gal. But Abby's been raving about them, and I do really like chai, so I thought I'd give it a whirl. I must say I was pleasantly surprised. It tasted summery (it was iced, by the way) and light. And I quite enjoyed the greenness of it! Try one and tell me what you think.